Welcome to our LIVE SHOW from Little Haiti Cultural Center in Miami, Florida! We are joined by Uprooted & Rising leaders Estefanía Narváez and Miles Francisco, and the amazing local musician Inez Barlatier. 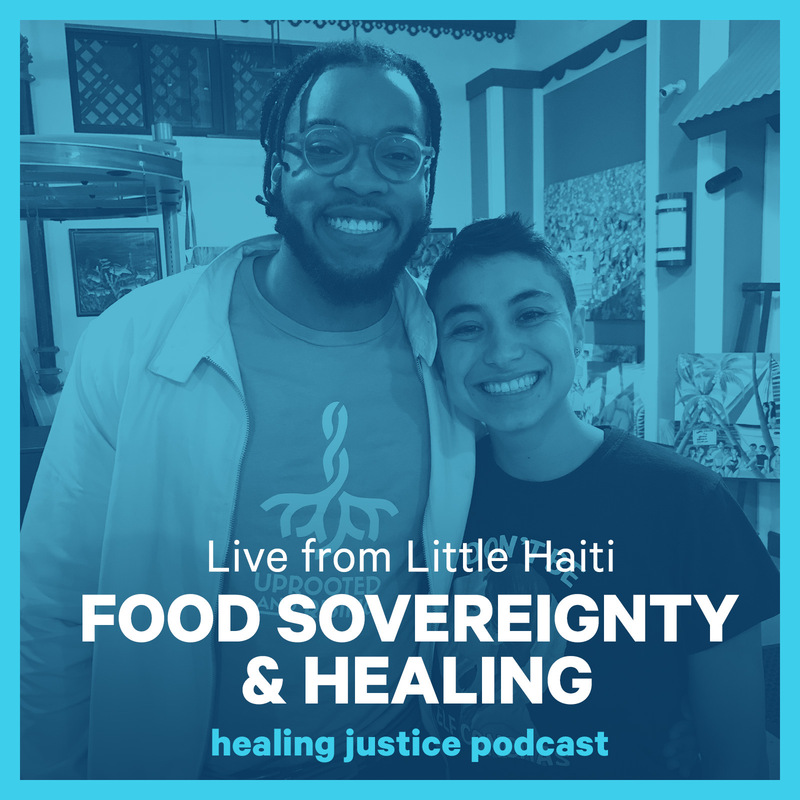 We shared live music, deep personal stories, and learned about food sovereignty as a site of liberation and healing - from its parallels to survivorship, to the origins of soul food in West Africa, to what Uprooted & Rising is mobilizing around now. A big thank you to the lively crowd at The Funders Network Conference, and to the Emily Hall Tremaine Foundation for sponsoring our presence there. An extra special thank you Michelle Knapik for your vision and coordination to bring it all together. Thank you to Phillip Brown of Spring Up for running the Facebook livestream, Guido Girgenti for audio editing and production, and Zach Meyer at the COALROOM for music and mastering. Resilience is deeply necessary for us to survive and thrive, but it can often be imposed, distorted, or misunderstood. So we wanted to hear from our people what it means to them, and how they cultivate it for themselves. 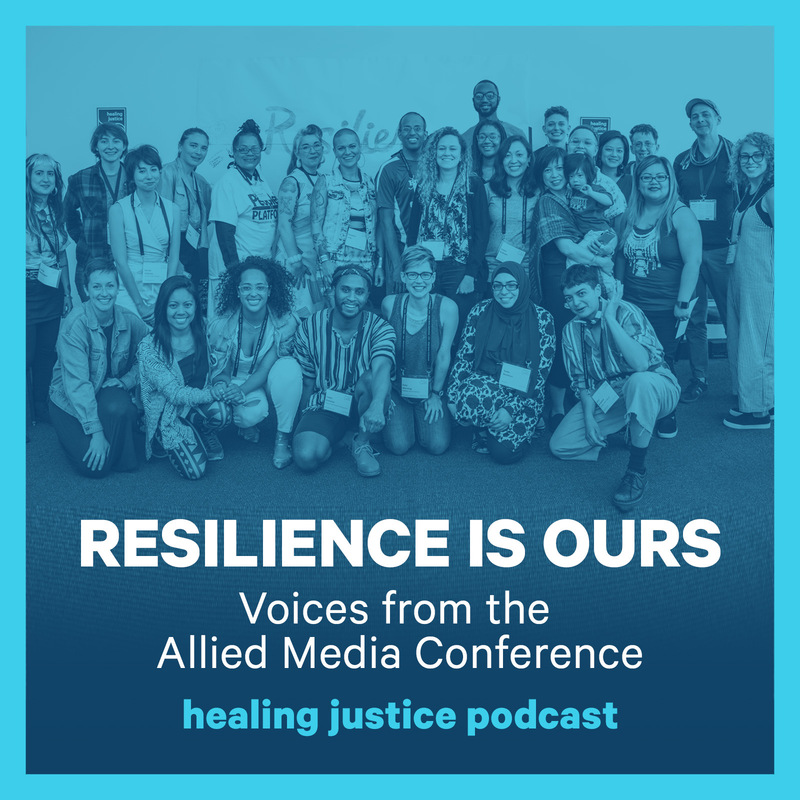 This past June, our podcast volunteer team from all over the country took a trip to Detroit together for the 20th Annual Allied Media Conference (AMC), and hosted a workshop called Healing Justice Podcast Story Lab. 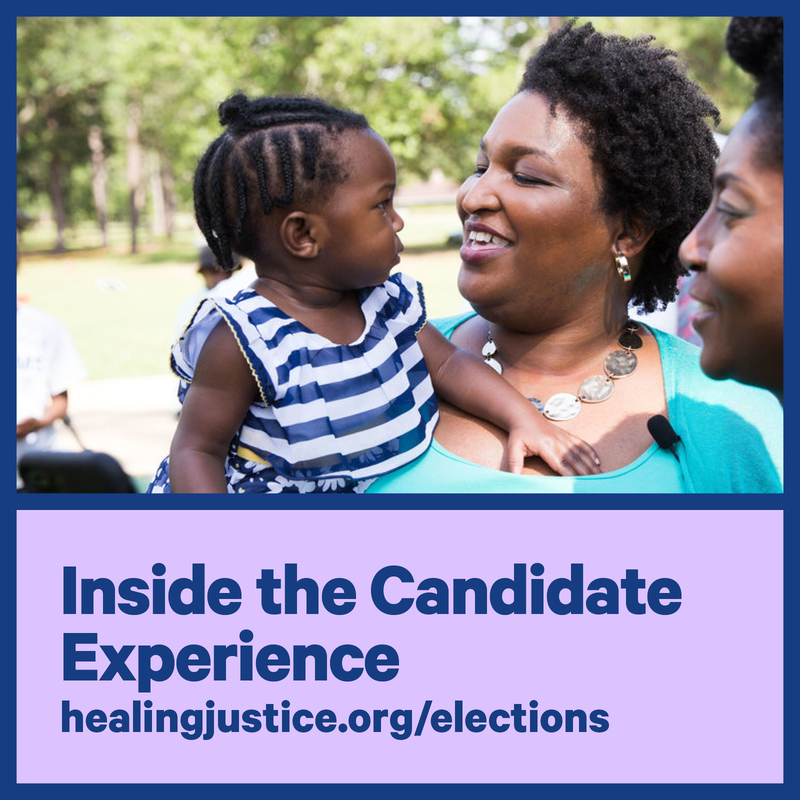 We set up recording booths and asked participants to share the experiences, practices, and relationships that sustained them in their justice journey on the mics. In this episode we invite you to listen in and reflect on these many voices in their own words. 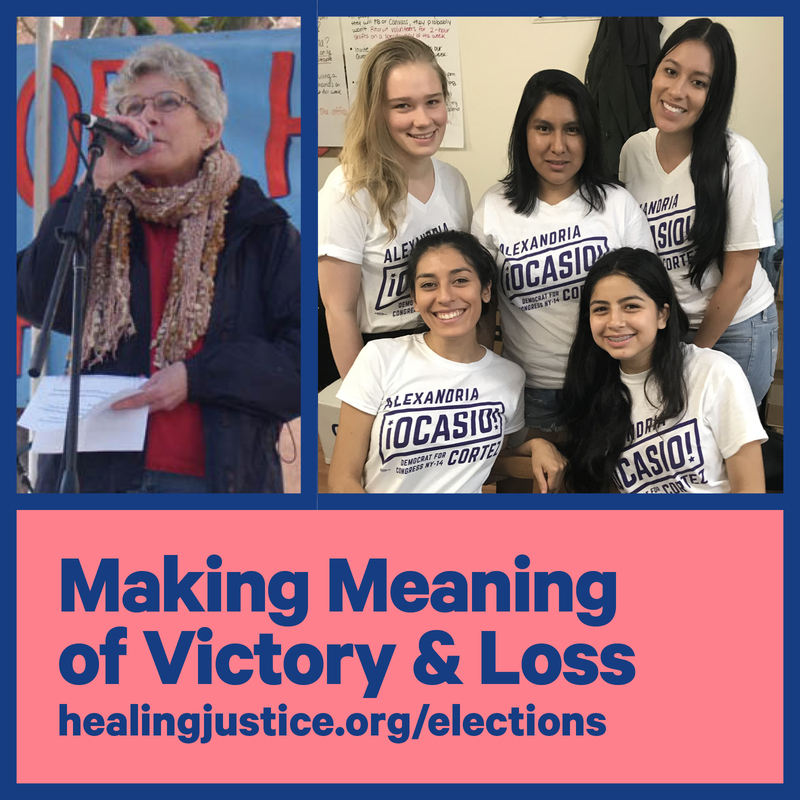 -- Find us on Instagram @healingjustice, like Healing Justice Podcast on Facebook, and tweet at us @hjpodcast on Twitter -- and check out our Instagram Story highlight for visuals from the workshop! -- Rachel Ishikawa, Myra Al-Rahim, and Parke Ballantine for the creative direction and production of this episode, and your leadership at the workshop at AMC. -- Marcia Lee, Justin Campbell, and Kate Werning for co-designing and co-facilitating the Healing Justice Podcast Story Lab workshop at AMC in June 2018. -- Miriam Zoila Perez and JD Davids for being an essential part of the production team at the workshop. -- Kirin Kanakkanatt, Brittany Koteles, Charlie Bruce, Nat McClellan, and Josiah Werning for your volunteer support at AMC. -- Zach Meyer at the COALROOM for mixing and final production, Josiah Werning for graphic design, and Danny O’Brien for intro and closing music. AND THANK YOU TO OUR GUESTS: Each of these folks and many more attended our Story Lab workshop at AMC and generously shared their brilliance with us. The voices you heard include Chimaera Bailey, Hadassah Damien, Jekaren Olaoya, Symone Johnson, Nada Beydoun, Isis Rose, Rajelin Escondo, Vern Plotkin, Lydia Nylander, Sarahlyn Pablo, Unny Nambudiripad, Frankie Mastrangelo, Chaz Barracks, and Carlin Christy. 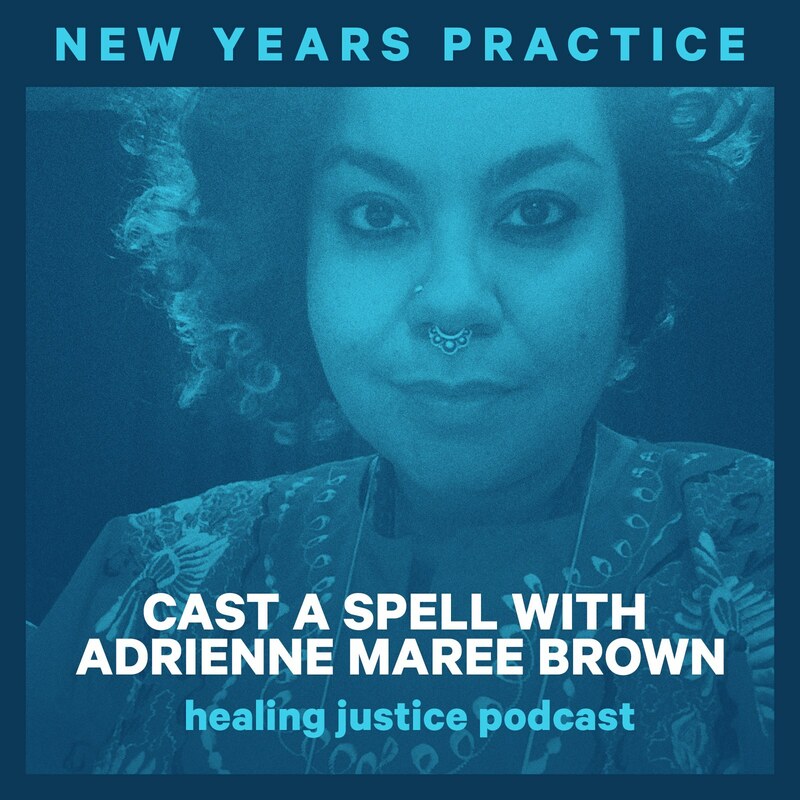 Welcome to a very special New Years practice with adrienne maree brown, where she'll guide you through writing and casting a spell for yourself and your community to help transition us from 2018 to 2019. You'll need 30-90 minutes, a clear space, something to write on, and something to write with. This practice was originally posted last year, so some of you have already done this with us! If you have your spell from last year, we give instructions in the first 10 minutes about how to release and transform it so you are ready to create a new one. (Thank you to Mya Spalter, author of Enchantments, for her recommendations.) If you want to skip right now to where the 2018-19 instructions begin, jump to about 17 minutes in. We'd love to hear from you about the spell you've written to transition into the new year. Share a selfie, the full text, one line, or your reflections on what it was like to do this practice on social media with us - let's see what our community is conjuring for 2019! 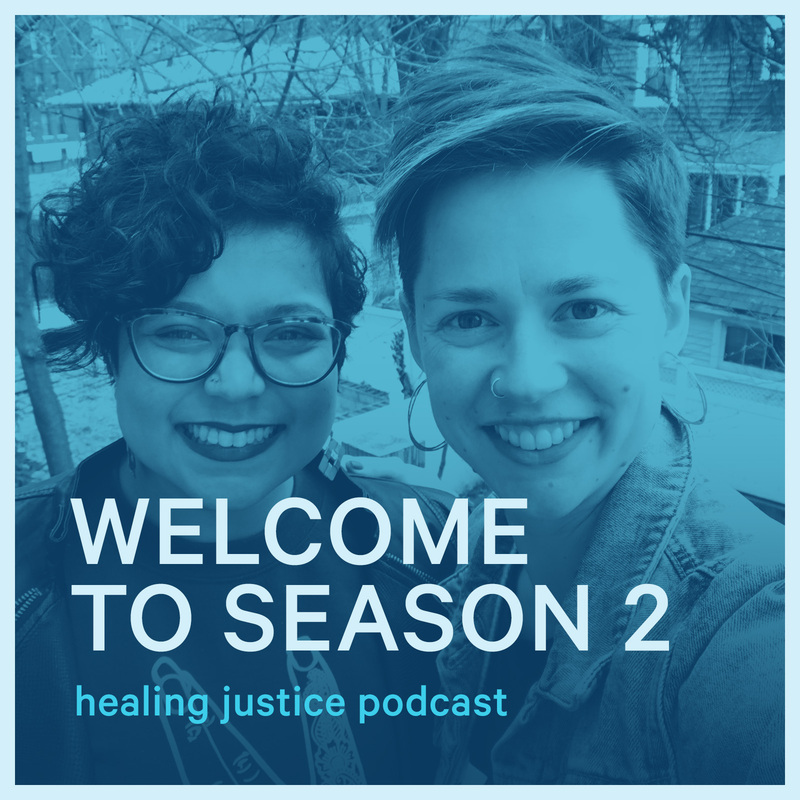 Find us on Instagram @healingjustice, like Healing Justice Podcast on Facebook, and tweet at us @hjpodcast on Twitter. adrienne maree brown is the author of Emergent Strategy: Shaping Change, Changing Worlds and the co-editor of Octavia's Brood: Science Fiction from Social Justice Movements. She is a writer, social justice facilitator, healer/doula, and pleasure activist living in Detroit, and co-host of the podcast How to Survive the End of the World. WILL YOU HELP US CONTINUE IN 2019? So many people need this support to help sustain their liberatory work, and these practices and this wisdom are not ours to sell. We have radical faith that we can sustain this project on a gift economy, with the generosity of our community as our fuel. - Were there things in this year that felt too heavy for me to carry? - How do I feel like I am in my power and in my dignity in this present moment? - What does liberation mean to me? - 3rd stanza: With your eyes on liberation, what are you going to practice? Welcome to our first-ever LIVE SHOW, coming at you from our first birthday party! We are joined by Kate Werning, Jillian White, Sumitra Rajkumar (of episode 12), Alexis Francisco (of episode 33), The Peace Poets (of episode 23) with Dr. Drum, and 150 of our celebrating friends in Crown Heights, Brooklyn. We enjoyed powerful music with The Peace Poets and Dr. 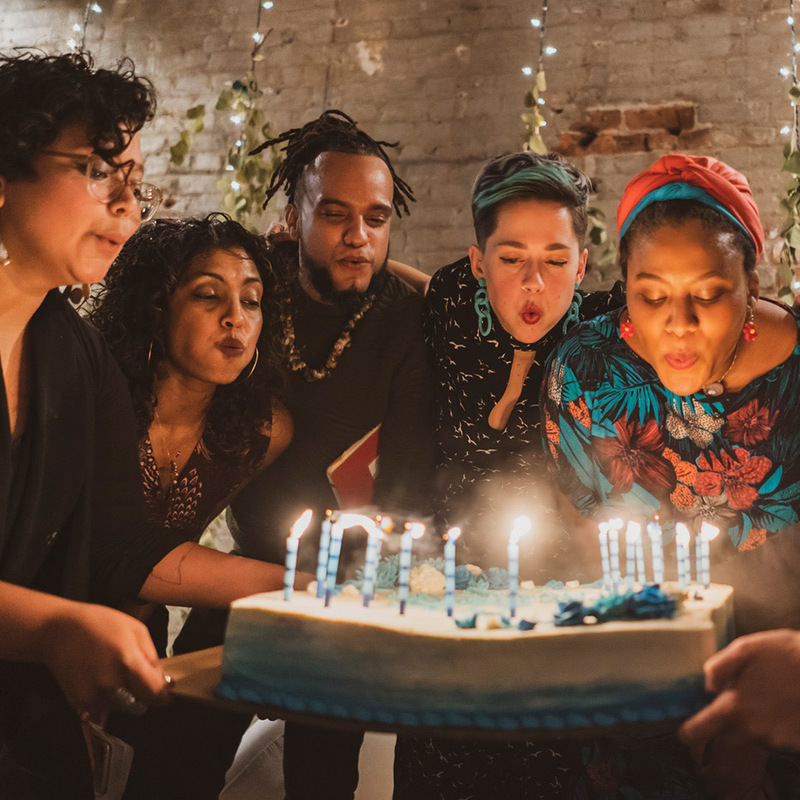 Drum, talked about how healing is moving for us in our organizing work, and celebrated the amazing things this broader community has moved in the world this past year. We also talked about our dreams to continue this powerful project, including Jillian joining the team as our Producer, and bringing in movement partners as regular correspondents to share the voice and content curation on the show. We need a lot of help to make that sustainable and possible. Can you help us get there? Thank you to to the teams who made this party possible! Our planning & hosting team: Kirin Kanakkanatt, Parke Ballantine, Nadia Tykulsker, and JD Davids. Our amazing volunteers: Michelle Ling, Sophie Lasoff, Christina Shiroma, Sophia Holly, Thais Marques, Tom Corcoran, Josiah Werning, Krissan Pattugalan, Jana Lynne Umipig, Adrienne Haddaway, Joey Dosik, Danielle Pomorski, Melanie Berkowitz, and Tasha Amezcua. Our sound team: Anne Pope and Myra Al-Rahim for your work live at the show, and Zach Meyer at the COALROOM for mastering the episode. Our brilliant guests: Sumitra Rajkumar, Alexis Francisco, the Peace Poets (RAM 3, Frankie 4, Lu Aya, The Last Emcee), and Dr. Drum. And a BIG thank you to our sponsors of the party: Third Wave Fund, Pierce Delahunt, Beth Jacobs, Maura Bailey, and Hallie Boas. You're invited to our first birthday party & live show! Sliding scale tickets and sponsorships available. Did we mention there will be cake? 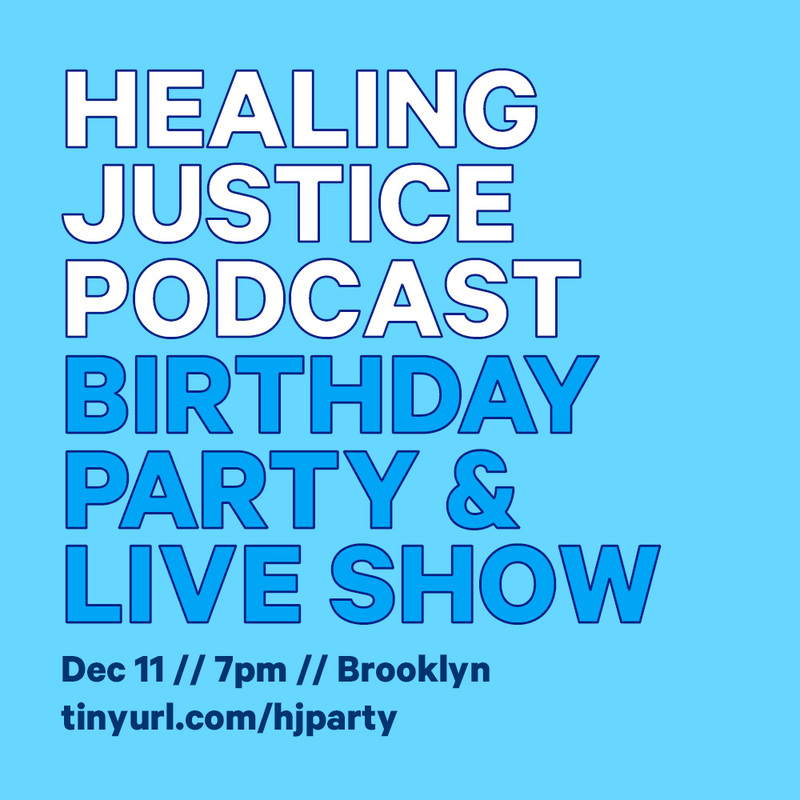 If you can't be in Brooklyn on December 11th, join us via livestream on our Instagram (@healingjustice) or Facebook page (Healing Justice Podcast). Thank you to Kirin Kanakkanatt, Jillian White, Kate Werning, and Zach Meyer for creating this episode. We made it through to November 7th! Come get through your midterm election adrenaline/terror hangover with us. The world is drowning in spin and hot-takes, so we're holding a different kind of vulnerable, real-talk space to process the results and work to understand what comes next for our movements as we take stock of both our wins and our losses. Let's hear about how fun Alexandria Ocasio-Cortez's victory party was *and* recommit ourselves to the long-game work of building a multiracial populist movement for liberation. We're joined today by Working Families Party National Director Maurice Mitchell, longtime organizer Barbara Dudley, and Alexandra Rojas of Justice Democrats. Maurice Mitchell is the National Director for Working Families Party (WFP) and has over two decades of experience in political and community organizing. Before joining WFP he co-founded Blackbird, a movement-building organization that offers communications services and has worked closely with Black Lives Matter Global Network. Barbara Dudley has been a movement activist for 50+ years, but only in the last ten has she engaged in electoral politics, via the Working Families Party. She was a lawyer for GI’s resisting the war in Vietnam, for tenant unions, and for unionizing farmworkers, she went on to serve as Director of the National Lawyers Guild during the Reagan years, then Director of Greenpeace US, and then Director of Strategic Campaigns for the national AFL-CIO during the Clinton years. Alexandra Rojas is the Executive Director at Justice Democrats (JD), an organization founded by former staff of the Bernie Sanders 2016 presidential campaign in order to transform the Democratic Party into a party that works for its voters, not just its corporate donors. Welcome to our CANDIDATES TELL ALL episode, powered by Black women! Running for office is an incredibly strenuous experience. Why do candidates do it, and how do they keep themselves grounded along the way? Esteemed guests join us today to dish about candidacy and all that it entails: Stacey Abrams (Democratic candidate for Governor of Georgia) tells us how she stays energized on the campaign trail and what her favorite TV shows are, Ashlee Marie Preston (the first transgender candidate to run for state office in California) tells us about what she learned when taking on the establishment from the inside, and Nelini Stamp (Working Families Party National Organizing Director) shares about how she takes care of herself and what it takes to select and support great candidates nationwide. Nelini Stamp is the National Organizing Director at the Working Families Party. She works with volunteer leaders across the country to build local progressive infrastructure, and is deeply involved in social movement work around economic and racial justice. Ashlee Marie Preston is a Civil Rights Activist, Media Personality, Producer, Writer, and Speaker. She was a candidate for California State Assembly District 54 in 2018; making her the first openly trans person to run for California State Legislature. Stacey Abrams is Democratic nominee for Governor of Georgia and former House Democratic Leader. She founded the New Georgia Project, which submitted more than 200,000 registrations from voters of color between 2014 and 2016. 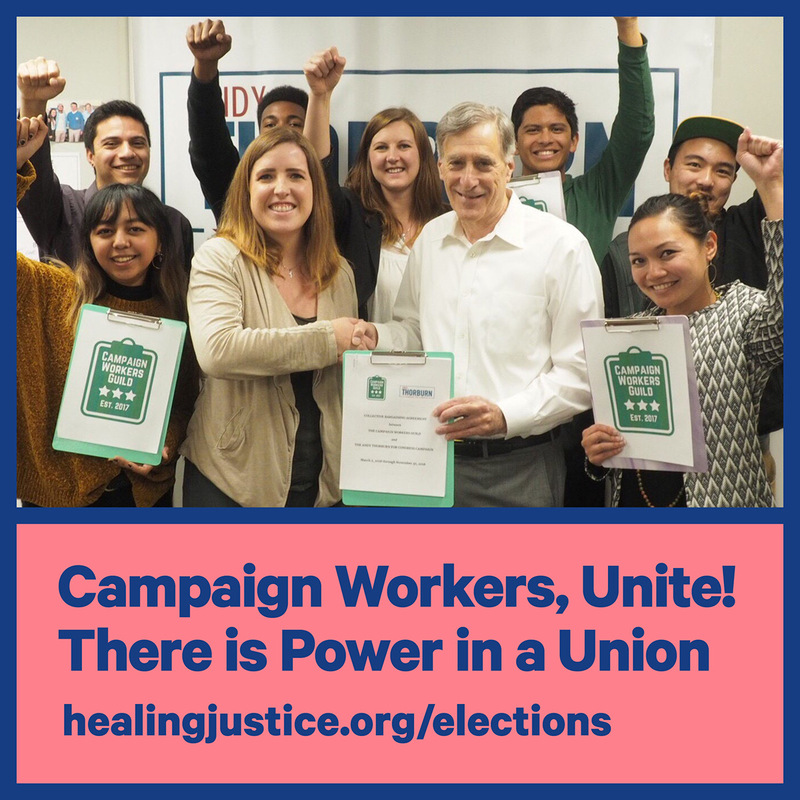 Campaign Workers Guild (CWG) is organizing the movement to unionize political and issue-based campaign workers nationwide. CWG Vice President Meg Reilly joins us to talk about why transforming the working conditions of campaigns is necessary for our end goals, how building worker power impacts strategy and what’s possible, and gives us a play-by-play of where to start if you want to start a union. Host Kate Werning and organizer Shanequa Charles share some of their experience and learnings from recently participating in the unionization process on the Cynthia Nixon campaign. Stay tuned all the way til the end for a silly solidarity song. Thank you to Brittany Williams, Kim Huynh, Alexandra Flores-Quilty, Melanie Berkowitz, Duncan Meisel, and Sophie Lasoff for the song! Women campaign managers are transforming the old boys club of transactional campaign culture. We’re joined first by Nancy Leeds of the infamous CampaignSick Tumblr, home of the memes that make us laugh til we cry… and then just keep on crying. 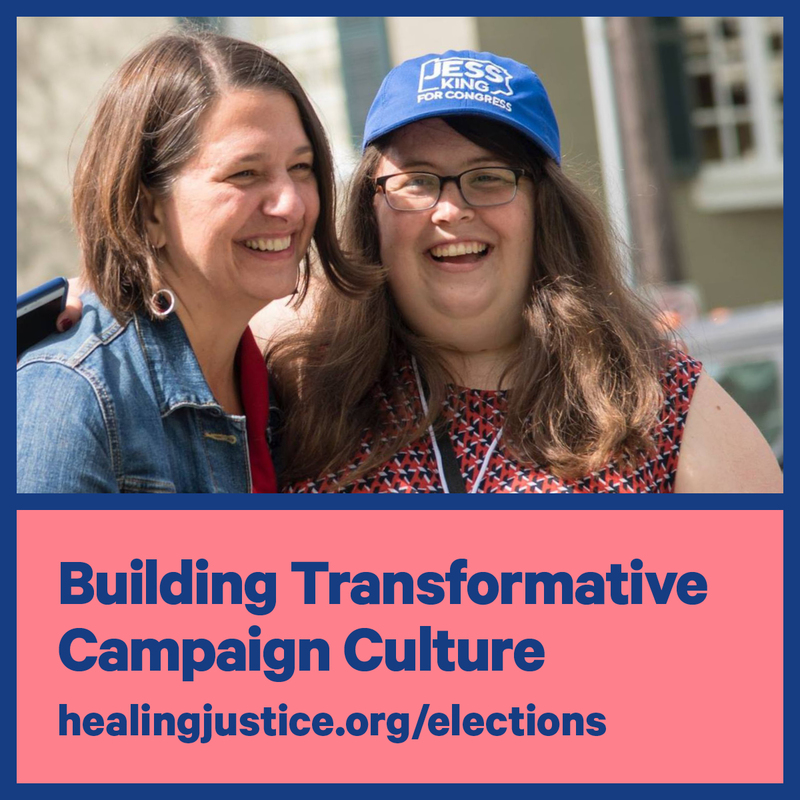 Then Becca Rast shares about her transformative work as a campaign manager on the Jess King Congressional race in Pennsylvania, and how a long-term perspective can build healthy campaign culture and leave powerful organizing infrastructure behind after election day. Nancy Leeds has worked on Democratic campaigns since 2006 when she was an organizer for the Minnesota Coordinated Campaign, electing Tim Walz and Amy Klobuchar. Since then she has worked on races of every size from statewide to city council in every region of the country from LA to Cambridge to Little Rock. Nancy has also worked at and consulted for politically oriented non-profits. She holds a Master’s in Public Administration and Master’s Certificate in Gender and Public Policy from Columbia University.